A few weeks ago, as I was looking at the results of a dictation for ta and ti-ti with my first graders, I saw that while most students "got it" and did very well, I still had a few in each class who seemed to struggle, who perhaps could dictate simple patterns but nothing beyond that. This always seems to happen--the struggling few--and in the past, I've shrugged and moved on. But this time, as I sat there, thinking about those kids, I thought of a grade-level teacher, and how they handle struggling students. I knew they didn't just shrug and move on....they kept trying! Of course I should keep trying--I knew that--but how? 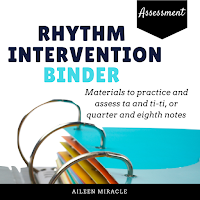 I've been to tons of workshops and conferences over the years, have had so many enlightening and transformative educational experiences, but I've never heard anyone discuss how to intervene with students who are struggling with their rhythmic understanding. Sure, I can play games, and activities, and sing "Apple Tree" one more time, and try an "I have/ who has" game, and whatever fun strategy I want, but how do I work one on one individually with those students? What do I say to them? So I thought of those grade-level teachers, and what they might do. I had heard of RTI, or Response to Intervention, and began researching what questions might be asked if a teacher is doing RTI. Then I took these questions and adapted them for rhythm. I saw that many strategies started with simple questions and then the teacher asked more difficult questions, attempting to see where the breakdown was, so I created a list of questions that started with "How many syllables are in the word cat?" and ended with the students dictating a rhythm pattern. I then created centers for my other students in which to be engaged while I worked one-on-one with each of these students. This is, in my opinion, a great advantage to doing centers work. Besides the student-centered environment which centers foster, it gives teachers the ability to provide intervention as needed. I've heard other music teachers say that we should never assess during centers--as then students may be off task--but I think it all comes in good planning. If you create centers that students can do well without your help, then that one-on-one time is possible...and is so valuable! 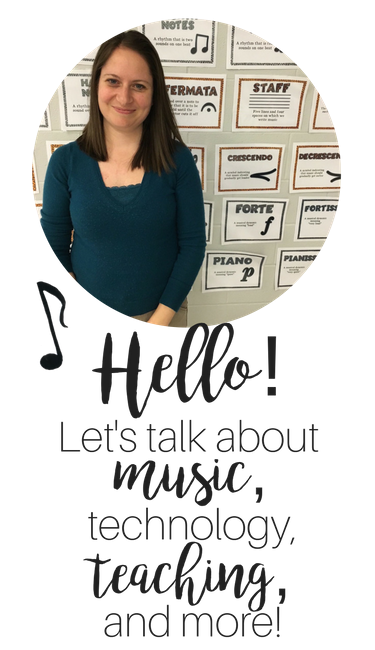 I've written a lot about centers in the music classroom; you can read those posts here. This time, though, I decided to try something new while I was working one on one with students: I let students choose their centers, and move freely from one to the other, so I didn't have to worry about telling students when to rotate. I wasn't sure how this would go, but then I tried it and was SO happy with the results! The students were excited to choose whatever they wanted, and I didn't get any questions like, "I don't have anything to do because I'm done!" Instead, they simply went onto another center! Here is a student working at a QR code center...first he read the pattern, then he scanned the QR code and listened to the pattern! I'm lucky enough to have 8 ipad minis in my classroom, and all ipad minis were full almost the entire time! Here is a student playing "Bang" from my Popsicle Stick Rhythm Games Set. I had two more centers--one was from my friend Karla's "Trace it! Write it! Find it! Use it!" Ta and Ti-ti set, which you can find here. In this center, students had to read the pattern, then put a bingo chip on all of the patterns that matched. Then all the students at that center switched cards! At my last center, students rolled a die and then traced the pattern in that column. Then, while those six centers were going on, I pulled students one at a time and worked with them individually. I went through the questions from simple to more advanced, and found where each of the students' rhythmic understanding broke down. It was so interesting! Some students did really well until the dictation piece, while others right away had problems, as they mixed up syllables with sounds. So I made sure to explain with those students that I was asking for syllables, not sounds, which helped all of the students I worked with, and then tried other strategies on the spot, such as having students clap as they said the patterns, have students listen for patterns of 1 and 2, etc. Then at the end of each lesson, after I worked with a few students one-on-one and the rest of the students were engaged in centers, I gave the post-test, which is used to determine how well students met their growth target for my SLO, or Student Learning Objective Plan. This was really interesting to me...5 out of the 8 students I worked with individually--those that were not meeting their growth target prior to me meeting with them and were struggling with rhythmic dictation--did in fact meet their growth target with their post-test! And of those five, three of them exceeded their growth targets! So exciting! Even though a few students didn't meet their growth targets and are still struggling with rhythmic dictation, now I know what their weaknesses are, and where their rhythmic breakdown starts to happen. Such useful information! I'd love to hear how this goes in your classroom! Good luck! love this idea! our district is doing the same...I would really like to look into implementing this next year. Thank you for sharing such an in-depth look at how to use this in your classroom! Thanks Christine! I'd love to hear how it works for you! I also used to run into that issue of "sounds" vs. "syllables." In older grades, they work on clapping out syllables and recognizing spelling patterns within that syllable to help them spell unknown words. I started using that same type of thing when talking about syllables and dictating the rhythm of the words in our phrases. I ask them how many claps is gets. Then we put our beat chart up and talk about where the claps fall in the chart. "How many claps were in beat one? Beat 2?" After a few weeks, we don't have to have such a long conversation. Love the RTI idea! Thanks, Aileen! Can you please distinguish the difference between rhythm writing and rhythm dictation? I have heard differing definitions from other music teachers so I wanted to clarify what those two meant in your case. Does it have to do with using the neutral syllable versus the rhythm syllables for you? Hi there! In this instance, rhythm writing is simply copying a pattern down (so the teacher says "ta ta ti-ti ta" and students write that with notation.) 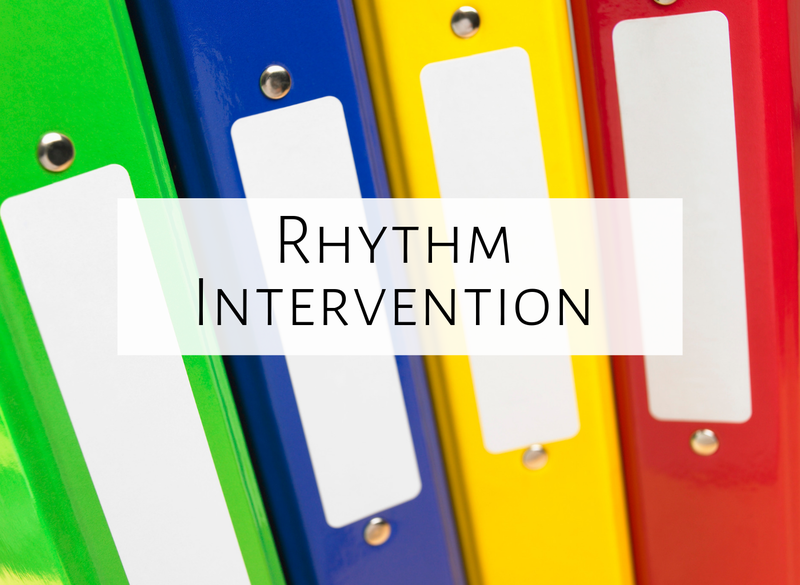 Rhythm dictation would be the teacher clapping or playing the pattern without saying the rhythm syllables and the student writes it down. Hope that helps!